Vol. 2 no. 8 of al-Majalla al-Tijarriya contains: a continuation of the Guaranty Trust Company's "Effects of the War on European Neutrals," this time focusing on Spain; reports on the linen industry and the cotton market; an article by Dr. Philip K. Hitti on the Syrian people as immigrants and merchants; and overviews and news on business conditions in the United States. Salloum Mokarzel's editorial urges struggling Arabic-Speaking businessmen to seek financial aid from either the United States or from the community of Syrian-Americans. Salloum A. Mokarzel and Syrian-American Press, “Syrian-American Commercial Magazine Vol. 2 No. 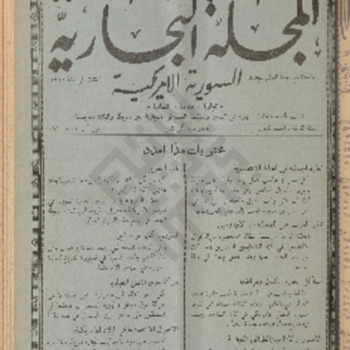 8,” Moise A. Khayrallah Center for Lebanese Diaspora Studies Archive, accessed April 20, 2019, https://lebanesestudies.omeka.chass.ncsu.edu/items/show/13933.